Please visit our Open House at 4472 QUEBEC ST in Vancouver. I have listed a new property at 4472 QUEBEC ST in Vancouver. I have listed a new property at 1101 2165 40TH AVE W in Vancouver. On top of Kerrisdale. This southwest facing one bedroom CO-OP apartment with a large balcony has great views all the way to the Gulf Islands. The concrete building has undergone extensive updates including: windows, exterior,balconies, roof, and plumbing. The elevator and boiler are scheduled for 2014. A Bright, open, efficient layout with updated appliances, silk draperies and a large feature wall mirror make this apartment feel much bigger than it is. Walk out the front doors to a world of convenience. Shopping, recreation, and restaurants. Have a coffee with friends, stroll, shop, eat, repeat. Unbeatable value for Westside living. YOU'LL LOVE IT! The Real Estate Board of Greater Vancouver reports that residential property sales in Greater Vancouver reached 2,661 on the Multiple Listing Service® (MLS®) in October 2013. This is a 37.8 percent increase compared to the 1,931 sales recorded in October 2012, and a 7.2 percent increase from the 2,483 sales recorded in September 2013. 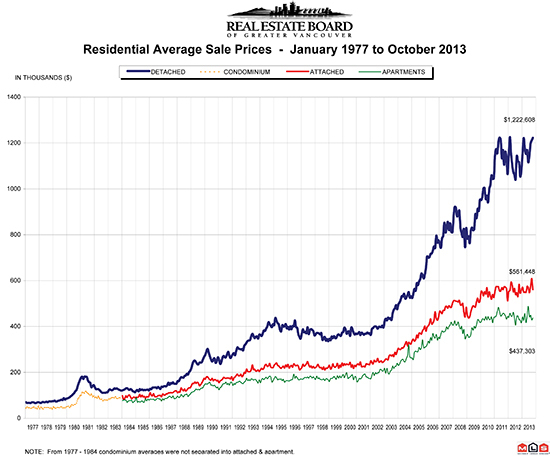 New listings for attached, detached and apartment properties in Greater Vancouver totaled 4,315 in October 2013. This represents a 0.2 percent decline from the 4,323 new listings reported in October 2012, and a decrease of 14.2 percent compared to the 5,030 new listings reported in September of this year. Last month’s sales were 2.8 percent above the 10-year sales average for the month, while new listings for the month were 1.9 percent below the 10-year average. The total number of properties currently listed for sale on the MLS® in Greater Vancouver is 15,257, a decline of 12.2 percent compared to this time last year, and a decline of 5.3 percent compared to September 2013. The sales-to-active-listings ratio is currently at 17.4 percent in Greater Vancouver. The MLS® Home Price Index composite benchmark price for all residential properties in Greater Vancouver is $600,700. This represents a 0.5 percent decline compared to this time last year. Sales of detached properties reached 1,067 in October 2013, an increase of 35.1 percent from the 790 detached sales recorded in October 2012 and a 9.5 percent increase from the 974 units sold in October 2011. The benchmark price for detached properties decreased 0.5 percent from October 2012 to $922,600. Sales of apartment properties reached 1,098 in October 2013, an increase of 36.7 percent compared to the 803 apartment sales recorded in October 2012, and an increase of 14.6 percent compared to the 958 sales in October 2011. The benchmark price of an apartment property decreased 0.9 percent from October 2012 to $365,600. Attached property sales totaled 496, an increase of 46.7 percent compared to the 338 attached property sales recorded in 2012 and a 29.8 percent increase compared to the 382 attached property sales recorded in October 2011. The benchmark price of an attached property is $458,000, which is virtually unchanged from October 2012.